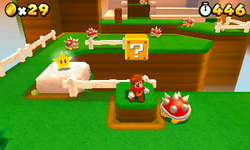 Special 1 is the first special world of Super Mario 3D Land that the player unlocks after defeating Bowser in World 8- : Part 2. It takes place in a sea green field at night with flowers and hills in the background. 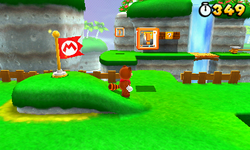 The map music is a remix of the game's World 1 map music. 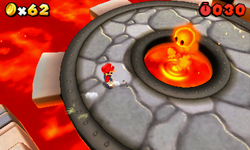 If Mario defeats Dry Bowser in the last stage of this world, Luigi is saved and becomes a playable character. Special 1-1 A harder version of World 2-1, taking place at sunset. 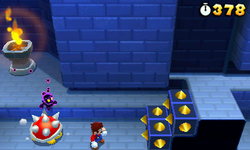 This level introduces the Statue Leaf, as well as the Poison Mushroom. 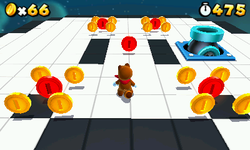 Special 1-2 A harder version of World 1-2 with the player being chased by a Cosmic Clone. Special 1-3 An athletic course similar to World 2-3. 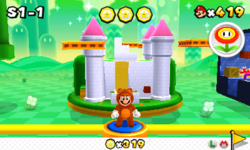 Special 1-4 A harder version of World 6-1 with the Cheep Cheeps being replaced by Paragoombas and Boomerang Bros.
Special 1- A harder version of World 1- Castle with the time set to 30 seconds. The boss is Dry Bowser and after completing this, the player unlocks Luigi. Requires 110 Star Medals to be unlocked. This page was last edited on November 18, 2018, at 16:46.